The weather has been pretty nasty here all week so the following pictures are the best I could get between rain showers. I finished the labyrinth quilt earlier this week. This was made using a raw edge reverse appliqué technique. I used fusible web only for the center flower section. As I mentioned earlier, this created a mountain in the middle! It remained as a UFO for a number of years. I decided it was time to finish it or pitch it. I cut an 18″ circle of poly batting and another 30″ circle of pot batting and spray basted them to the back of the labyrinth. Then I loaded it onto the frame with a full layer of Warm and White batting. I started the quilting by outlining the black. I went back and quilted each narrow black area with a bit of a scribble. I wanted to make sure those skinny bits didn’t fray and disappear in the wash! They did fray but not disintegrate. Then I quilted the outside background and the center section. 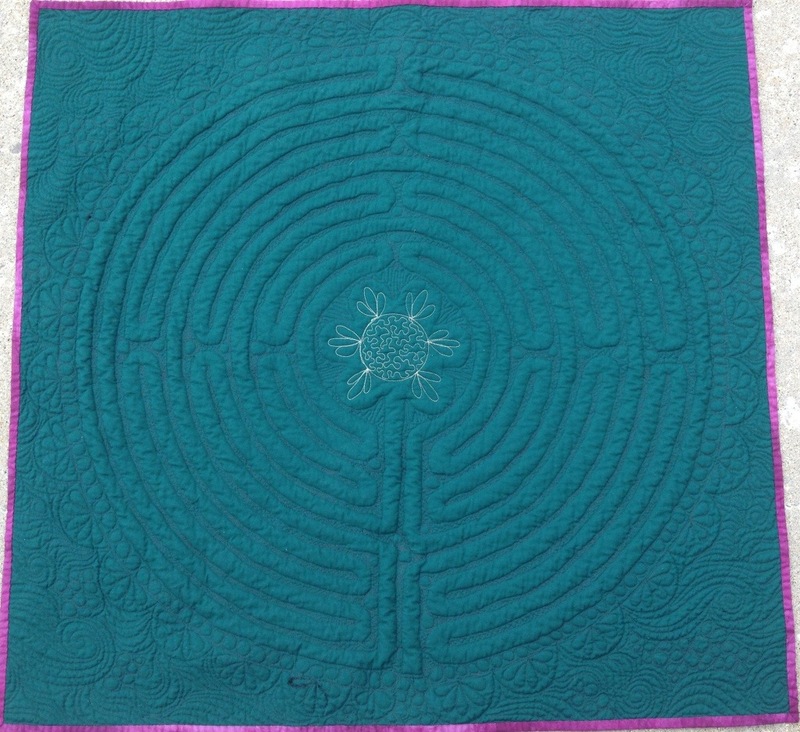 I didn’t manage to trim this so that the quadrants of the labyrinth are square with the edges of the quilt. I might have to go back and fix that. 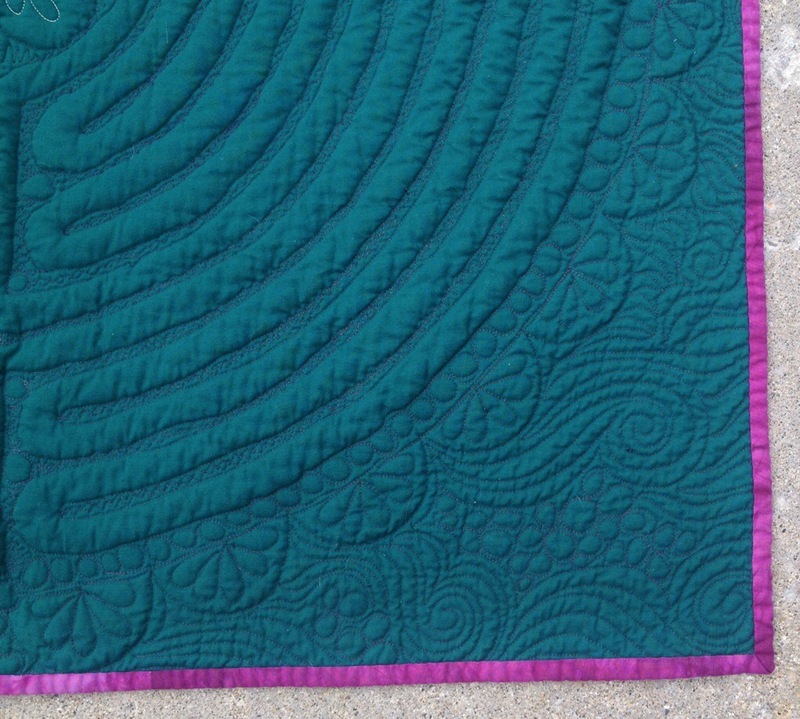 It wasn’t easy quilting through the three layers of batting at the center but it did take up the fullness in that area. It is far from perfect but I am glad that I finished it. It won’t win any awards but it looks pretty good from a distance. I will probably hang it in my cubicle at work. This is my entry in the Spring 2014 Blogger’s Quilt Festival hosted by Amy over at Amy’s Creative Side. This piece was on my Quarter 2 Finish Along 2014 list so I will be linking up with Katy at The Littlest Thistle . My original list of goals can be found here. I am linking up with Crazy Mom Quilts for Finish it up Friday, Sarah at Confessions of a Fabric Addict for Can I get a Whoop Whoop?, QuokkaQuilts for Thank God It’s Finished Friday, Richard and Tanya Quilts for Link a Finish Friday, and Sew Can She for the Saturday Show Off Party. 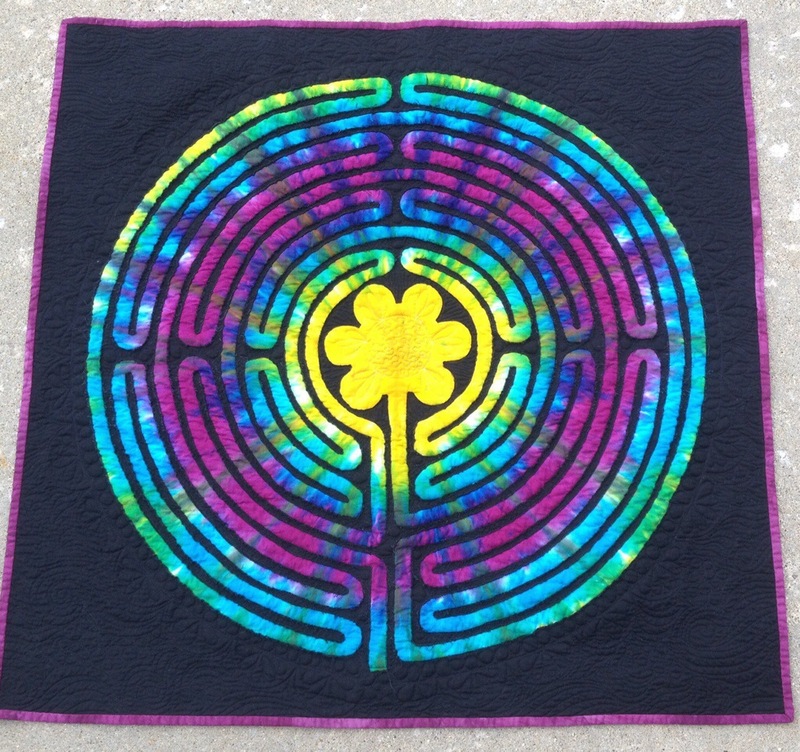 This entry was posted in FAL 2014, Finishes, Labyrinth. Bookmark the permalink. I thought I recognized this quilt, and lo, there was an old comment from me to prove it. LOL. This visit courtesy of Val’s Archives. Wow! I would have quit! What a powerful and complicated quilt. I have never done reverse appliqué and this doesn’t make me want to try it. It skeers me!! Beautiful! You did a beautiful job! 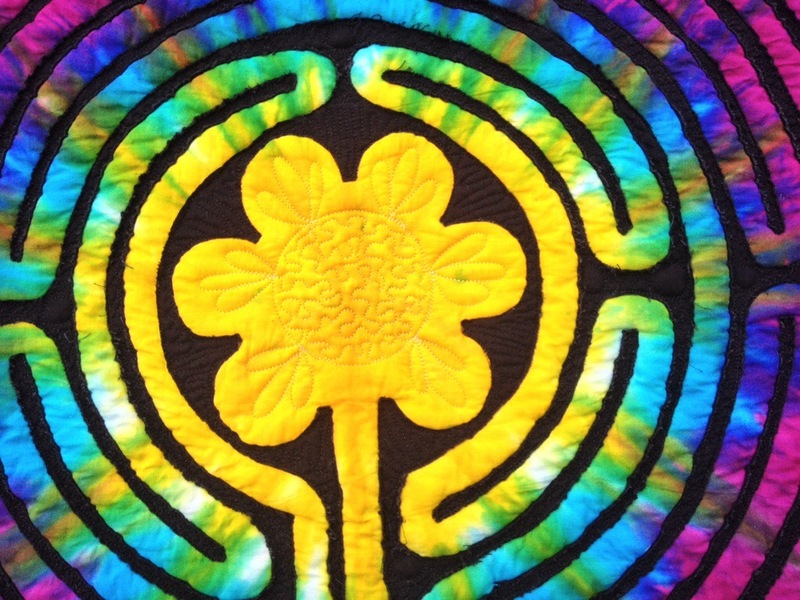 The labyrinth is such a powerful symbol. I know of two or three spiritual retreat centres near my hometown that have one in their gardens for walking – they always make me smile and remember to be more thoughtful and intentional. Ilove the neon colors. I know you are happy with the way it turned out. This is such a cool quilt!! The colors pop really nicely and the quilting is to die for, especially in those teeny tiny places. Is there a pattern for this particular quilt somewhere? I have not attempted reverse appliqué yet and it sure would be nice to have something to refer to, and a cutting pattern to aid in getting the piecing correct. Best of luck in the contest. Is it something we can vote on and maybe help you win? I am reposting this as my entry into the Blogger’s Quilt Festival in the Art Quilts category. wow it is all about that quilting! I thought the maze was cool! Your quilting is so pretty! Oh how gorgeous! What a cool quilt. 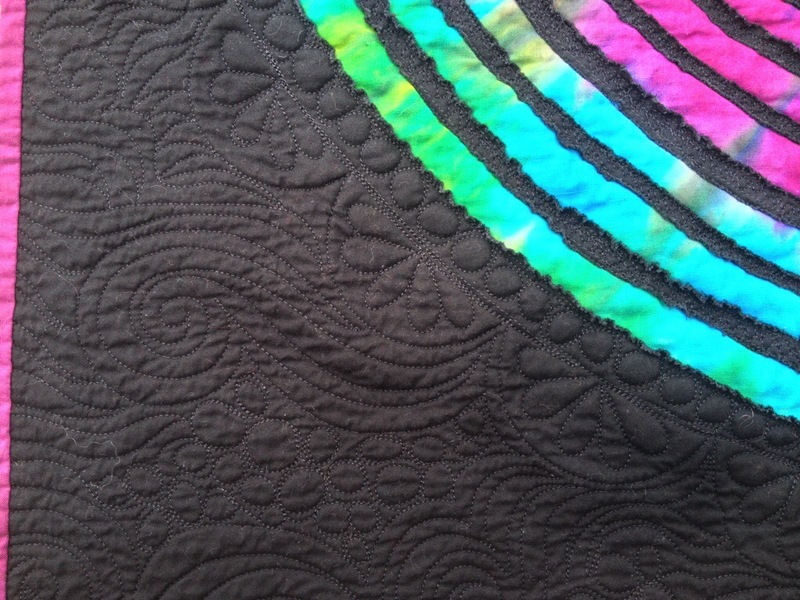 The back of the quilt shows off your amazing quilting. That is really cool! Super work! What a masterpiece! 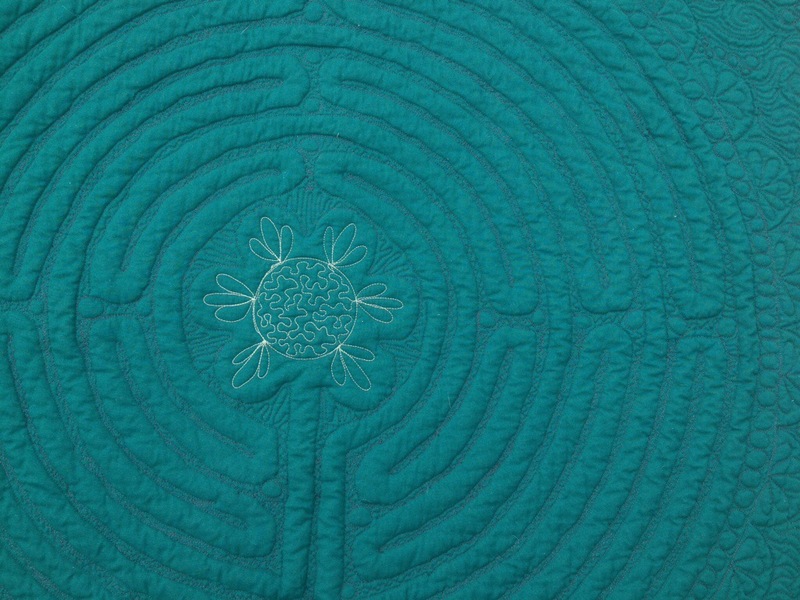 I love how the quilting turned the back into a beautiful labyrinth all its own. Extraordinary! This looks like a very challenging project. amazing quilting.It will look great on the cubicle wall. Way to go on finishing this! I have a reverse appliqué project that also has been dogging me for four years. 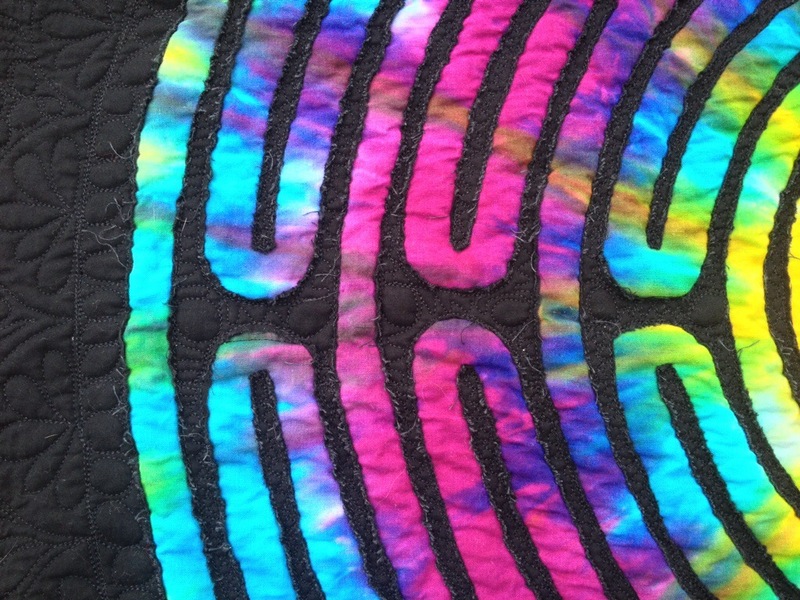 I love the luminosity of your quilt! And the quilting is fabulous. Congrats on a beautiful finish! Wow – look at that tiny quilting. It came together really well – it’s beautiful! Elegant quilting designs. Really tiny “scribbling” in those narrow strips, difficult (for me anyway), but a great effect. What an awesome looking quilt! Great quilting, too! A finished neat and tidy project is better than an uncompleted one. I think it is perfect for a cubicle. I am sure it will be a conversation piece. Opps! We must be quiet in the library.